IT’S FINALLY HERE—that week of bliss that you’ve been keeping a countdown tally on your desk calendar for the last six months. Maybe you’re spending a week at the beach you’ve been coming to every summer with your family, or maybe you’re eating your way through Italy (um, hello, we’re jealous if this is you), or maybe you’ve simply taken some time off just to get a little R&R at home. Wherever you are, you’re on vacation, and you intend to use this week to relax and get away for a little while. But just because you’ve pressed pause on your usual routines of home and work doesn’t mean you should take a vacation on taking care of your body. 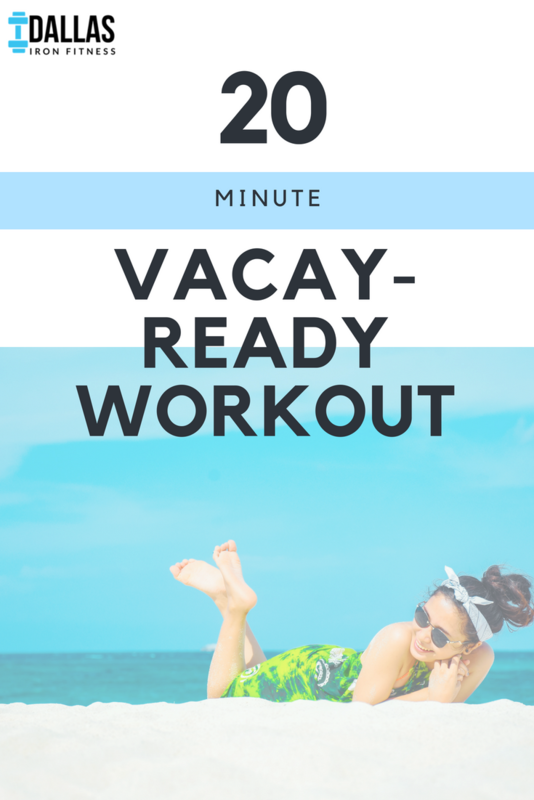 You can do it: just 20 minutes of movement is all you need before you get to grab your beach tote and nap under the sun. Can’t get any easier than that! You’ll do as many exercises from this circuit as you can in a 20 minute period, so have your stopwatch or timer on your phone handy. High knees mimic the motion and speed of jogging in place; only with each step, you are bringing your knee up to create a 90 degree angle between your torso and thigh. Begin in high plank position—weight on your palms, arms extended directly below your shoulders. Bending your elbow, bring your right hand up from the ground to tap your left shoulder, then lower your hand back into original plank position. Repeat this motion, only with your left hand tapping your right shoulder. Do 20 Plank Shoulder Taps, alternating between each arm. Begin on your back with your knees bent and feet flat on the floor, knees hip distance apart or together, fingers laced together behind your head. Using your core, lift yourself up completely until your entire back is off the floor. Lower back down and repeat. Stay on your back for this one, extending your legs in front of you. Engaging your core, lift both legs together as far up as your flexibility will allow; the goal is to lift your legs up at a 90 degree angle in relation to your body, but don’t worry if you’re not there yet—just lift as high as your current fitness level will allow. Do 10 Lying Leg Lifts. Let’s throw it back to our days of junior high P.E. with 20 traditional jumping jacks. Begin in a standing position, with legs together. Hinge at your hips to bend down so that your hands are teaching your toes. Slowly walk out your hands until you are in an extended plank position. Now reverse, reverse (“Cha Cha Slide,” anyone? ): Slowly walk your hands back until you are in your initial hinge position, touching toes. If you can, straighten your legs so you can get in a good hamstring stretch. Again, don’t worry if you can’t completely straighten your legs and touch your toes—we all have different flexibility levels, and that’s totally okay! Once you’re in the original hinge position, repeat this by walking your hands out once more. Lay on your back, bringing one of your legs into your chest, and extending the opposite leg out straight. Core is engaged, head slightly raised off the ground. With your legs, mimic the bicycle motion, extending the leg next to your chest out and bringing in the opposite leg. Remember to keep your abs tight! Begin in a triangle stance with your legs—each leg a little further out than your shoulders, toes pointed slightly out. Clasp your hands together between your legs, and lower yourself into a squat, creating a 90 degree angle between your thighs and knees. Be sure to keep your back straight and not hunched over. Rise back up to starting position, then repeat. Once you’ve completed this circuit, start again from the top—you’ll do as many rounds of this circuit as you can within a 20 minute period. And then... go enjoy your vacation! Wish that you had someone who would tell you exactly what to eat and exactly what exercises to complete to help you reach your summer fitness goals? Introducing In Shape for Summer: Your 30 Day Meal Plan and Workout Guide. Compiled by Dallas Iron Fitness founder Kaitlyn Gannon, M.S. CSCS and dietician Erin Griffith, RD, LDN, this e-book is packed full with 30 pages of expert-guided meal plan and workouts (just like this one!) to get you in shape for the summer.